Invisible Illness or Chronic Illness? What's the Difference? When we say we have a "chronic illness," we are specifying thethis illness is likely going to stick around. But when we say we have an "invisible illness" we are describing a condition that is hidden to those who are around us. Why do we say we have an "invisible illness"? Is is because we feel invisible to people? Years ago the term "invisible illness" was rarely used. Before social media the opportunity to talk about your disease was relegated to a local support group and perhaps a caring friend or two. Illness was something you spoke to your doctor about... and that was all. I became an online illness advocate when I built my first website for those with chronic illness in 1996. As the Internet has evolved from news groups to social media, much has changed. But I have seen one continual thread: people are eager to share about their illness experiences and gain both understanding and wisdom from their peers. I established Invisible Illness Awareness Week in 2002. Why? I saw an overwhelming amount of people who were coping with their disease itself -- the symptoms, progression, medications, and medical care. But when it came to how it impacted their lives -- most specifically their relationships, they were struggling. Asking, "Who am I with this illness?" If you have a chronic condition you may have shared one of the many illness memes on social media that attempt to explain what it is like to live with constant pain. The conversations that occur in blog comments or other platforms naturally take on an "us" vs. "them" mentality. We who are ill consider ourselves part of a exclusive club -- one we never wished to join. And it is difficult to believe that one who is healthy could really understand the reality of our life. There are simply those of us who "get it," and those who don't. So we use terms to describe our illness communities, such as "spoonies" (based on The Spoon Theory by Christine Miserandino). I have had heard the illness community call healthy people "normals." Unfortunately, this mentality, alongside some of the memes that are mean and sarcastic, can cause an even greater divide between us and the very people we wish to help understand our daily lives. Why is there so much emphasis -- and desire -- to talk about what people think about our illness? Regardless of what one's illness may be, when one is speaking of their "invisible illness" odds are it is related to a relationship. Our chronic illness is something we go to the doctor and discuss. Our chronic illness is what we treat with the medications and supplements. But our invisible illness is what affects how we deal with the world around us in regard to our body and its limitations. We talk about how our relationships affect our illness. And we talk about how our illness affects our relationships. We talk about marriage or dating relationships and how communication (or lack of) can make our illness worse. We talk about how support from a caring partner can help us cope so much better. We talk about bosses and our co-workers and if they even know about our illness. We question if should or shouldn't work, how much to tell a potential employer, and how to explain sick days to a supervisor. We share our stories about our young kids, our teenage kids, our adult kids, our troubled kids. Some of us wonder, "Should I even have kids?" And we wonder how much our illness is messing up our kids. We talk about our parents and if they believe we really are ill. We talk about caring for our mom or our dad, because a day will come when we are expected to be their caregiver. And how will we do this when we can barely care for ourselves? We talk about those occasional good days and how our friends now believe we are all healed and will have many more good days. What does this have to do with our actual disease? Regardless of your illness, it likely has many names. Chronic, degenerative, disabling, terminal, auto-immune, neurological, benign... and invisible. When we say we have a "chronic illness," we are specifying the length of time this illness is likely going to stick around. But when we say we have an "invisible illness" we are describing a condition that is hidden to those who are around us. Which shouldn't really matter. It shouldn't really matter whether people can see our inflammation, stubborn confused cells, digestive issues, chemical imbalances, infections, blood sugar, or high blood pressure. Because it's still there even if it can't be seen. But for some reason -- it does matter. As human beings, we want to be able to look at something (or someone) and be able to sum things up. If they can see what is going on inside of us, they know the message to give us. For example, if it is all in our head, then why would they need to search for the right words when we cancel our plans for the third time? Sure, they want to fix it, to help us feel better, to change our outlook. Healthy people have a desire to be able to see what is wrong with us, so they can say, "oh-h-h, now I understand." They want to help. Few feel they can be of help until they know what is wrong. Your illness may be invisible. No symptoms. None. But maybe not. We have just become a society that looks the other way, rarely taking time to understand why a person hesitates before standing or who struggles to open the door at the store. I notice many diseases now, as I have become more familiar with what "invisible symptoms" look like. I see the way a woman who steps asks the cashier to open a jar of spaghetti sauce, so she can go home and make dinner for her family. I see a child struggling to control himself and understand it could be the "H" (hyper) in ADHD. I see a man pause and fight for balance before stepping off a curb and I suspect he is concentrating on that simple step perhaps because of a stroke or a healing hip, or a recent back surgery. They are not invisible. Even their pain or physical muscle weakness is not invisible. And yet we call the diseases an "invisible illness." 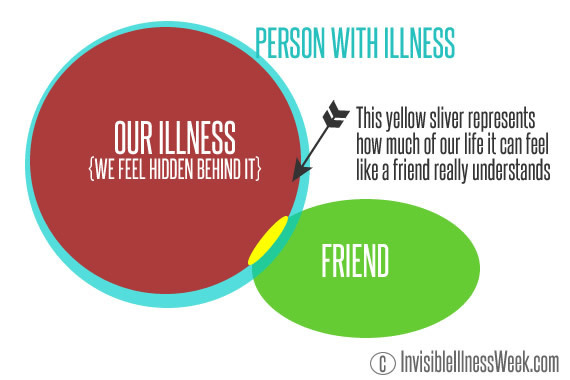 Why do we call our illness invisible? While the words "chronic illness" means long-term, the term "invisible illness" is more apt to describe the overlapping relationship between us and another person. And most of that overlap of us and them may not include our illness, a big part of our reality, and thus, identity. In the graphic image below, if you live with a disease that significantly impacts your average day, then you and I would be the teal color. The illness is red, and the friend is green. See what a small area the average friend may see of your life? They see the tiny bit of you when the illness isn't at its worst. And they see an even smaller part of you and the the illness when it flaring up. Now, some friends will overlap our circle a lot, but if you are chronically ill and struggling to figure out why your friend isn't "getting it" it may be because he or she is simply not in that part of the circle. Even though a friend may know you, it may just be that sliver of you that is peeking out from behind the disease. And yet, should our illness be a part of all of our relationships? Consider that we do not expect everyone around us to know our other experiences that define our identity. For example, must everyone know you are a mother, a divorced person, a person who recycles, or a Republican? Must one know you are dealing with infertility, an overdrawn bank account, a teenager who is stealing your medications, or a dog who eats your shoes? And yet, are those examples the same as a chronic illness? For some, yes. Your illness may be extremely private to you. Or it may be an inconvenience, but not disabling. Maybe you have more good days then bad days or the idea of sharing that you are too tired to go to the store is breaking etiquette rules. For others, no. We cannot move or breath or have a life without our illness showing its control over our body. It puts us in the position of fighting for everything. We fight to have fun, we fight to recover afterwards, we fight to be a parent and then we fight to raise the children, we fight to get up and we fight to go to sleep... we fight to matter -- to be something other than a person who is ill.
We feel like we need most people to know about our illness because it really is part of who we are. If they don't know about the fight, they don't really know who we are -- even though we wish it was different. And this is why invisible illness is spoken of. Many have a chronic illness. But those of us who are talking about having an invisible illness wish for people to understand us -- the real us -- not just the shiny, smiling-on-the-outside-I'm-fine us. We want people to see more than just the sliver. Invisible illness is all about the relationship. It is about how we are perceived. It is about how we are acknowledged, understood, explained, heard, interpreted, and rationalized. It is about our hope that we can have the courage to become transparent enough to reveal the ill us. And then, have the real us validated -- to be loved anyway. It is human instinct to look for acceptance. We aren't looking to be excused or exempt from the typical life. We don't want to be pitied or pardoned. We want someone to say, "I see YOU... and I will do my best to be the me you need." And that is what every person desires. ... Those who live with invisible illnesses. ... Those who live with visible illnesses. ... And those who live without any illnesses. Because you don't know what the person beside you is fighting for. So rather than waiting for someone to be what you need, start by being what someone else needs. Invisible Illness Awareness Week is Sept. 28-Oct. 4 and you can find it on social media with #invisiblefight #invisibleillness. Hundreds of thousands of people share their stories, their struggles, and their strengths, while encouraging one another and increasing the awareness for the public about the daily challenges they face and why they do not always feel as well as they look. Find more info at Invisible Illness Awareness Week or their Facebook page. 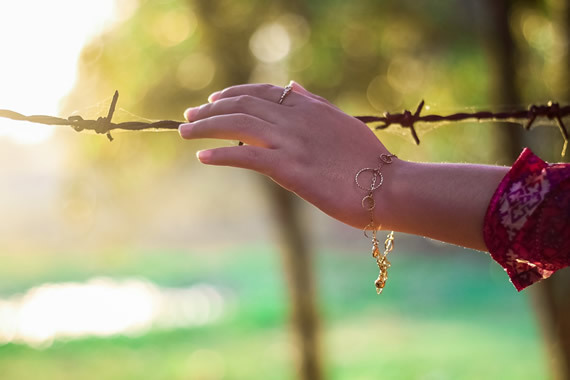 Lisa Copen has lived with rheumatoid arthritis and fibromylagia for 22 years, yet she has found great joy in her journey through her ministry, Rest Ministries, and establishing Invisible Illness Awareness Week in 2002. She is the author of a variety of books on living with illness, a mom Gutsy Goodness, wife, and she and her husband have an Etsy shop, Gutsy Goodness, with inspirational pendant necklaces.